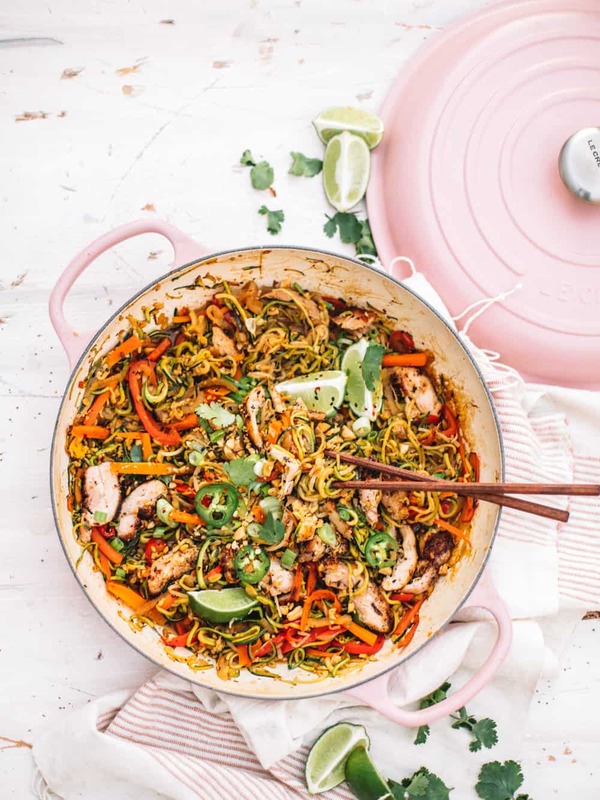 An easy, low carb version of chicken pad thai! 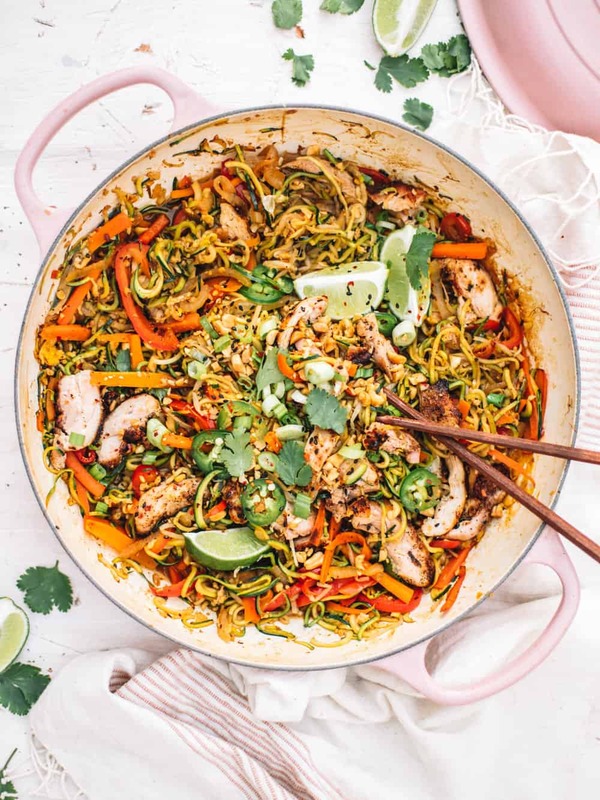 This healthy pad thai recipe is made with zoodles instead of brown rice noodles. I’ve also added in some bell peppers for extra texture and crunch. I love making this easy recipe for my family and putting out bowls of cilantro, peanuts, green onions, and limes for their own DIY topping bar! We also totally make this once a week for our weeknight dinner rotation! Give it a go for a healthy, delish meal! Since everyone was in town I knew I wanted to have a little dinner at the house! My house is teeny tiny but I always seem to make it work! My brother had been saying during his whole two week trip that he wanted me to make him some pad thai. I am a total people pleaser so of course I said yes! The only day they could all come over was Monday but I made it work! Entertaining people can be tough on the week days but I also think it’s totally doable! After a full day of shooting I made my way over to Trader Joe’s for the basics. Honestly, I don’t know how I would throw half the parties I do without Trader Joe’s. Their cheese section just saves me every-time. But for this dinner I knew I needed to get out of the box a little… We were having an asian based dish so before the main course I put together the cutest little asian appetizer dumpling board. I basically grabbed every frozen dumpling, egg roll, wonton, etc package from the freezer section at TJ’s. I grabbed a large serving board and put out three different types of dipping sauces. Piled the board up with steamed appetizers and egg rolls and let the fam go at it. Honestly, they loved it. There was hardly anything left and I very discreetly threw away my cardboard evidence lolz. It’s okay, they totally knew I didn’t make all the dumplings by hand. Serving something pre made on a fun platter instantly heightens what the appetizer actually is. While everyone was nomming on the epic asian appetizer board I threw on some music and mingled while I made some pad thai. When I’m having people over for dinner I usually try and stick to casserole type dishes or one pot wonders. I don’t always do this because I love to switch it up but if you’re short on time these are the best kinds of dishes to feed a crowd with! This was our first meal together since the holidays and I think everyone was trying to be a bit more conscious of what they are eating. Even my dear old Dad has taken a step in the right direction and trying to get his ‘health’ on. 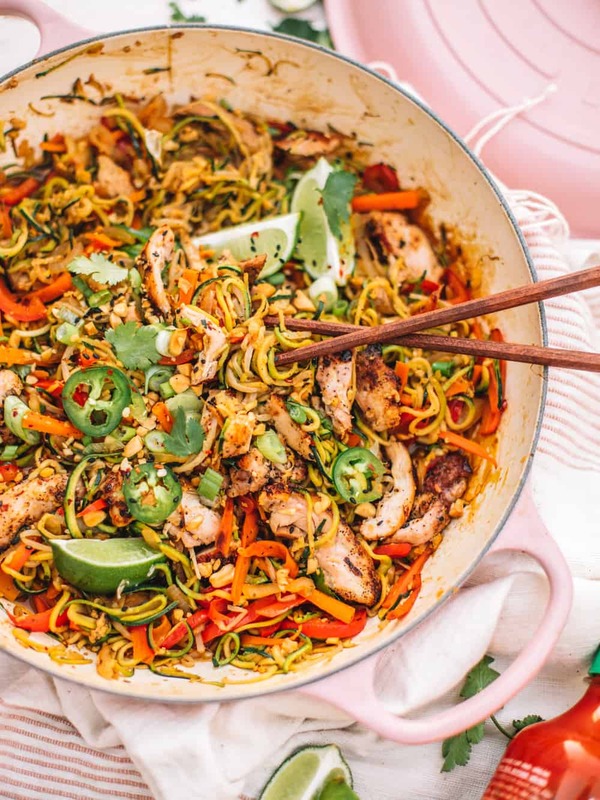 An easy way to lighten up a regular pad thai recipe is to just swap out brown rice noodles for zoodles! Do you guys like zoodles?! I got a spiralizer for my Birthday a few years back and I will admit I had only used it a handful of times. It just seemed like a lot of work for just a few minutes of actual use. BUT! I have given it a real chance and I have to say we now break out the spiralizer like once or twice a week. 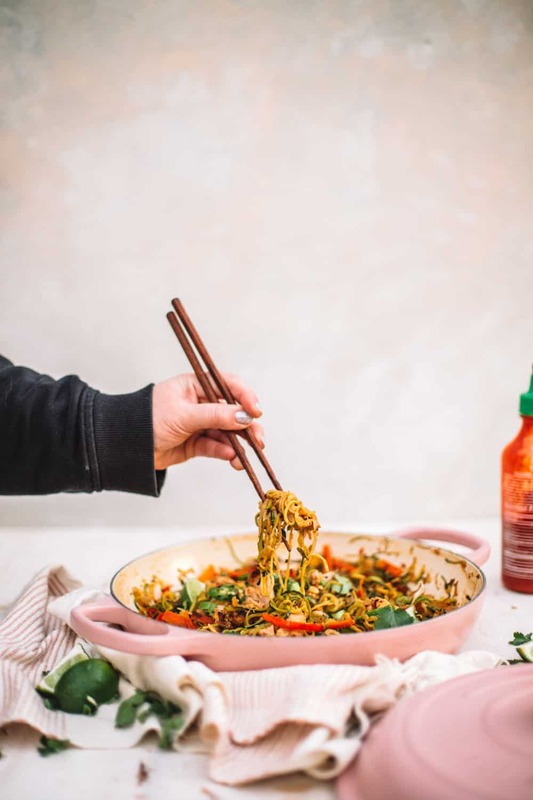 I was also really turned off by zuchini noodles because they often got watery when I cooked them, but now I know the trick! I add them in to any dish at the very end or I cook them up in a hot pan with just olive oil for 2-3 minutes. Either way keeps the noodles more crisp and tasting like, well, real noodles! Traditional pad thai doesn’t have as much vegetables added in but I love how much color the bell peppers brought to the dish! Anytime I can brighten up a normally ‘brown’ meal I do! The extra veggies added in more textures, flavors and a healthier twist. 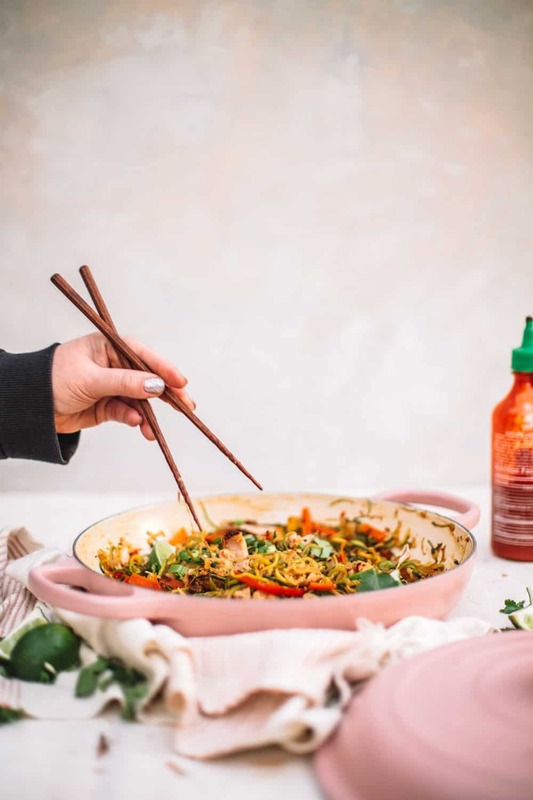 I sliced up some pan grilled chicken thighs for the protein but for this pad thai recipe you can add in grilled shrimp, pork, or even scallops if you’re feeling fancy! Squirt of sriracha if you like it spicy! For toppings: Put out small bowls filled with chopped cilantro, green onions, crushed peanuts, black sesame seeds and limes! OR for a weeknight dinner just sprinkle toppings over bowls evenly. Heat a grill pan or heavy bottom skillet on medium heat with 2 tbs. of olive oil. Season chicken with salt and pepper and cook for 4-5 mins on each side or until internal temp reaches 165. Let rest for 5 mins and thinly slice, set aside. In a medium bowl whisk together all of the sauce ingredients and set aside. Heat 2 tbs of olive oil in a large pan on medium heat. Add in thinly sliced onions, bell peppers, and carrots and cook for 5-6 minutes or until onions are translucent. Push veggies to one side of the pan and add in beaten eggs. Begin to cook eggs, moving them often until they are scrambled. Stir veggies and scrambled egg together and add in sauce mixture. Cook for 1-2 minutes or until sauce has thickened a little. 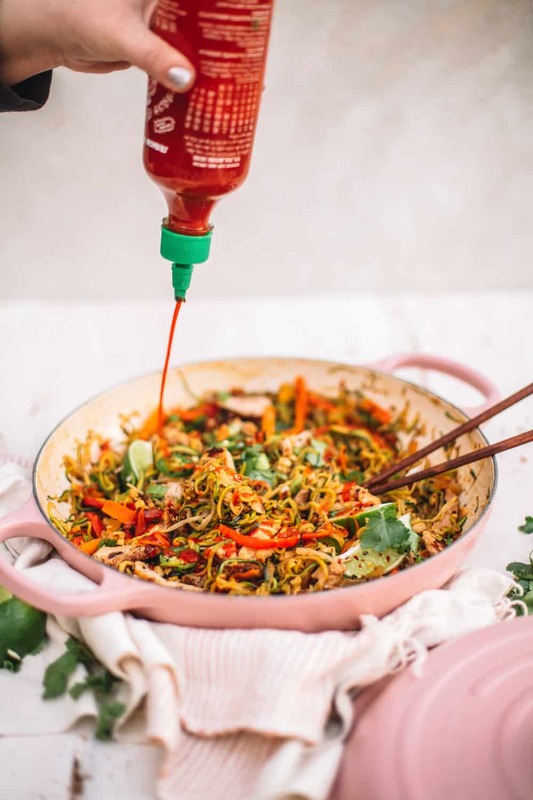 Add in zoodles and bean sprouts and coat well with sauce and make sure vegetables are well incorporated. Heat for 2-3 minute or until zoodles are tender but not mushy. Top with grilled chicken slices, cilantro, green onions, crushed peanuts and black sesame seeds. 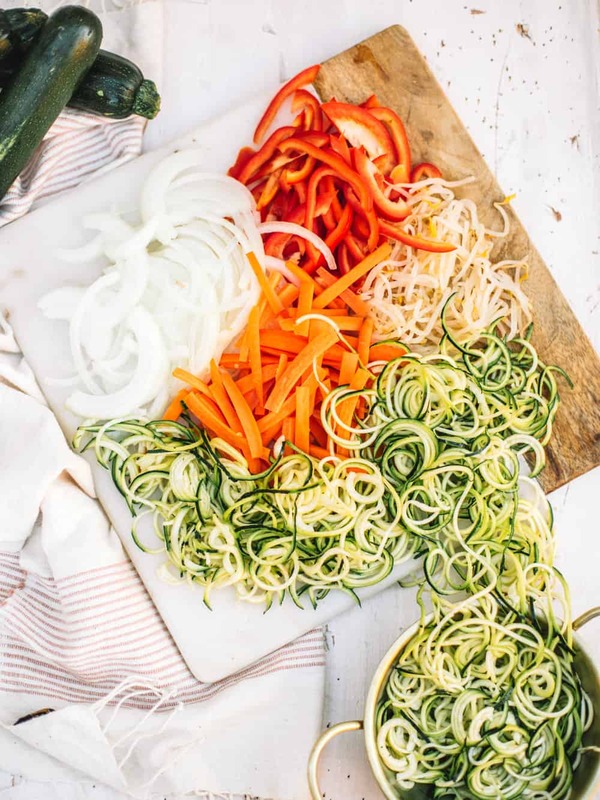 Any tips on cooking with zoodles? Mine tend to have a lot of moisture no matter what I do. I try to cook them as quickly as possible on higher heat! This helps them from breaking down and turning soggy. I’ve also tried paper toweling them off before cooking to remove excess water.